Forward Damontre Harris was dismissed from the Gators basketball team in December. GAINESVILLE, Fla. (AP) — Forward Damontre Harris, who was dismissed from Florida last month, is enrolled in school and trying to work his way back on the team. Coach Billy Donovan announced Wednesday night that he is giving Harris another chance. But Donovan says Harris won’t play this season. Donovan says Harris `feels like he has made a huge mistake and feels that Florida basketball is all he’s got, and he needs our help. … It would be a great story in his life if we can try and find a way to help him." 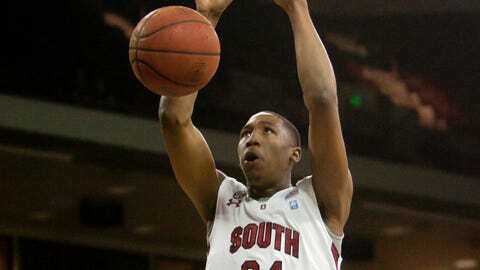 Harris transferred from South Carolina after coach Darrin Horn was fired in 2012. Harris sat out last season under NCAA transfer rules and was supposed to be eligible last fall. But Donovan suspended him indefinitely for violating team rules.